Swedish truck manufacturer Scania has conducted a presentation ceremony for the first six Liquefied Natural Gas (LNG) -powered trucks to enter service in Argentina, acquired by Transporte Andreu from the province of Mendoza. The ceremony took place in the presence of a delegation of officials from ENARGAS, the country’s national gas regulator. The Swedish company has been the first to work together with ENARGAS to import vehicles of these characteristics. “It is a proven technology and there are already more than 2,500 Scania trucks operating in Europe, which means that from a technological point of view, the product is efficient, safe and aligned solution with Argentina’s energy matrix.It is the first time that a vehicle that runs completely on Gas, and more specifically on LNG, has entered the country”, said Julián Rosso, Head of Sales Engineering. 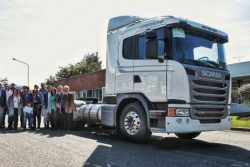 “The existing vehicles until now were bi-fuel and adapted; this is the first truck manufactured to operate exclusively with LNG, and that’s why we are pioneers”, he added. “Beyond the reduction of the environmental impact provided by these units, it is also important to note that they generate a lower level of noise. So from the operational point of view is an extremely powerful engine, very efficient and with a low environmental impact both in emission of gases and sound pollution”, said Rosso. The 6 Scania G 340 LNG trucks are employed by Transportes Andreu SA to transport LNG, thus forming a virtual natural gas pipeline which of itself uses Galileo virtual pipeline technology. These trucks are equipped with 9-litre and 5 cylinders, and are capable of delivering a power 340hp and a torque of 1600Nm. “Liquefied natural gas is stored in two cryogenic tanks at a temperature of 163°C below zero. With both tanks, you can achieve a range of more than 1,200km equal to any vehicle with diesel engine. To the efficiency and performance that characterizes any Scania engine is added exhaust gases that are clean and composed mostly of water vapor, which far exceeds the Euro 6 emission standard in force in Europe”, specifies Guillermo Hughes, Senior Advisor of Scania Argentina.